The cost of repairing damage to north west infrastructure caused by August's floods is expected to exceed £10m. Almost two-thirds of the average monthly rain fell across the region in a single night on 22 August. More than 100 people had to be rescued as storms ripped through the region washing away cars, gutting homes and businesses and collapsing bridges. The Department for Infrastructure (DfI) now estimates the total repair bill will reach £10-11m. More than 200 roads and 650 bridges in the region were damaged by the flooding. A DfI spokesperson said repair work continues at 90 bridges and seven roads remain closed across the north west. "All works have been prioritised and work will continue to reopen the remaining roads as soon as possible. "This work will continue over the coming weeks and months to ensure the integrity of the bridges are maintained and public safety is not compromised." 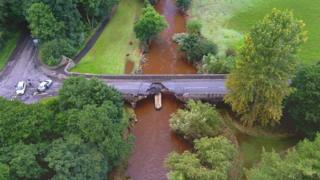 Work on the Ballynameen Bridge in Claudy, one of most severely damaged, will take another seven months to complete, the department said. To date £2.5million has been spent in the Derry City and Strabane District Council area while in the Fermanagh and Omagh Council area the repair bill stands at approximately £1.1million. The department said it has also carried out fortification work to flood defences including improvements to more than 80kms of river channels. It said it will continue to work with "local communities at known flood risk to build resilience." "DfI also continues to work with other departments and partner organisations as the recovery continues," the spokesperson added. The flooding also caused serious damage in neighbouring County Donegal in the Republic of Ireland. Donegal County Council estimate the cost of repair work across the county to be 15.3m euro (£13.5m).